School supplies fun & useful neat to collect. They didn't tend to be all that rare, or expensive, and you can use them to make Sonic projects at home too. 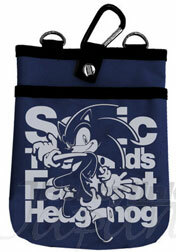 They also offer such a wide range of different and interesting Sonic theme things. Japan in the present and in the past probably still has the most items in this catagory. While the things here may be more difficult to collect, they're usually high quality and interesting to see. 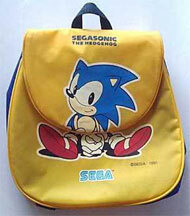 Because a lot of them are small, you'll see lots of different characters too, not just Sonic. Isn't this a charming yellow bag? 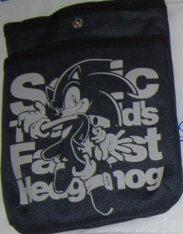 This is an older bag (may or may not have shoulder straps) as noted by the "Segasonic" branding at the top. 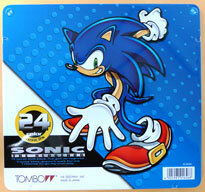 It has the very seldom-seen "Sitting Sonic" art. With his hands clasped and sitting still, he looks rather cute and totally classic-fun. When you lift up the flap, the art is printed under it too. Bag is likely to be uncommon. Coloring books are great. They provide a fun opportunity to not only color, but trace and draw as well. 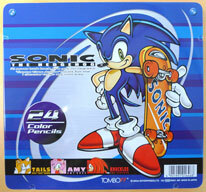 A Sonic X coloring book would be a great thing to learn with! 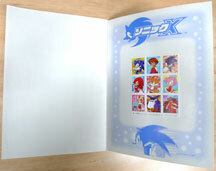 The inside is loaded with lots of line art from the show that you can color in or trace onto other paper. It likely has single character shots, scenes and various lesser-seen characters. In 2009, you can sometimes buy this from www.atamii.com --however, it does go in and out of stock because people like the item so well and it IS an import. Where could it be found naturally in Japan? right side is how it looked MIB. The "A2" probably referrs to the size of the pencil it would take.This is a rare sharpener. Photos by SonicTeam. These are metal pencil cases / pen boxes. Look at the one in the top left, it matches the sharpener above. 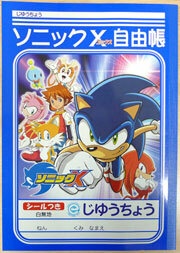 (mini Sonic on one side, Sonic vs. Metal on the other) The next ones are Sonic Adventure themed, and the last is the Sonic X one. The interior is shown there, as it's divided and also has more art & writing in the lid part. Photos by SonicTeam. All 3 of these are colored pencil sets inside of metal tins. Each was made by Tombo, and has 24 different colors inside. 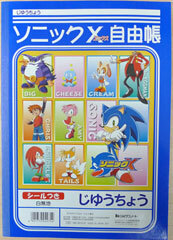 The corners all say 'press' (either in English or Japanese,depending which tin) The first 2 look very SA style, and were likely released soon after the game. For some reason the 2nd one features that skateboard he never manages to use, as well as Tails, Amy & Knuckles portraits. 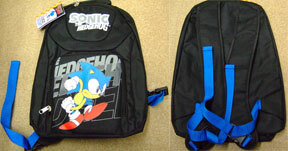 The left one is older and matches with several school supplies (See sharpener above, even) that had the whole "Sonic vs Metal Sonic" theme going on. 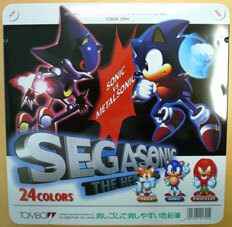 The art for Metal is fantastic on anything with this theme, but the size of the tin really shows it off here. 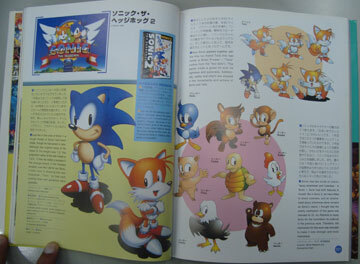 Look at the fun pose for Sonic & Tails at the bottom...they're both super classic & cute. Is this bag actually from/for Japan? Here are 2 different bags with the same design. 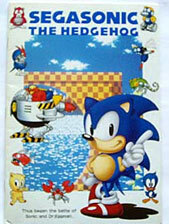 Its the "Sonic The World's Fastest Hedgehog" theme that appeared soon after Generations. 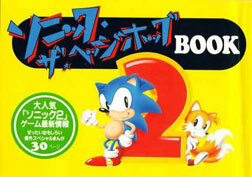 It has Modern Sonic jumping in front of Ariel Bold font for the text. This has been used on several items. This is a...yellow book. What does the sticker say? What is this for? It is a mystery. 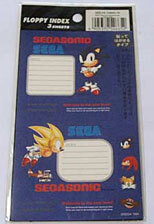 This is a Sonic Heroes themed mini note pad. 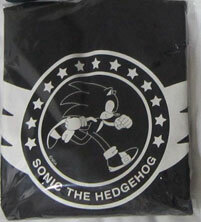 The front has Team Sonic with the Japanese logo. The back has all 3 teams with colored stripes. You can tell by the edge, that this is pretty thick/lots of pages. 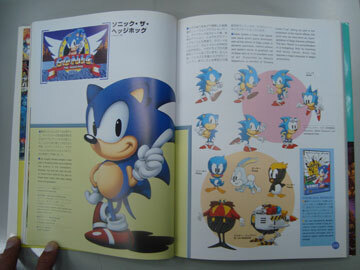 The pages have a light 'watermarking' of checkers, Team Sonic & the logo...so every page is an ad. The pages are also different color themes.